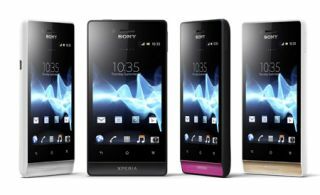 Sony Mobile unveils Xperia miro and Xperia tipo smartphones | What Hi-Fi? Sony Mobile is expanding its Xperia range of smartphones with the introduction of the Xperia miro (above) and Xperia tipo (below). The miro is available in a wide range of colours and includes Facebook integration through contacts, photo gallery and the music player. It's also fitted with Sony's xLOUD audio technology to convey "crisp and loud sound", and is pre-installed with Music Unlimited from Sony Entertainment Network. From launch the Xperia miro will have Android 4.0 (Ice Cream Sandwich), and includes a 3.5in display, 5MP camera, DLNA, Bluetooth and wi-fi connectivity and a front-facing camera for video chat. It comes in black, black/pink, white and white/gold. As for the Xperia tipo, shown above, it too has Android 4.0 as standard, is fitted with a 3.2in scratch-resistant glass screen, music player, 3.2MP camera, Bluetooth, wi-fi and is available in red, white or black.